Dad, I love you. You’re a genius and I am learning more about the amazing mind you have with every new encounter. I visited my dad this morning and surprised him with an early Christmas gift — the camera I had been using to document our time while he was living on the streets. As I handed the camera bag over to him, he raised his eyebrows and asked what it was. I anxiously told him to open it and watched him slowly open the zipper to reveal the DSLR inside. My father getting acquainted with his first digital camera. I still cannot believe he is off the streets. It’s almost like I have to consciously tell myself to breathe and slow down, so I don’t explode with my feelings and overwhelm him. I know that he is still adjusting and all we can do is take it day by day, but my heart is humbled and overflowing with pride. We went for a drive to a local camera shop so he could get a lens cap. He was adamant that we protect the glass (shame on me for not replacing the cap), and stated “once you scratch the glass, it’s all pau… all buss’ up so it’s junk.” On our drive there, I couldn’t help but keep glancing over at him playing around the with the buttons of the camera. It warmed my heart to see him so interested and curious. 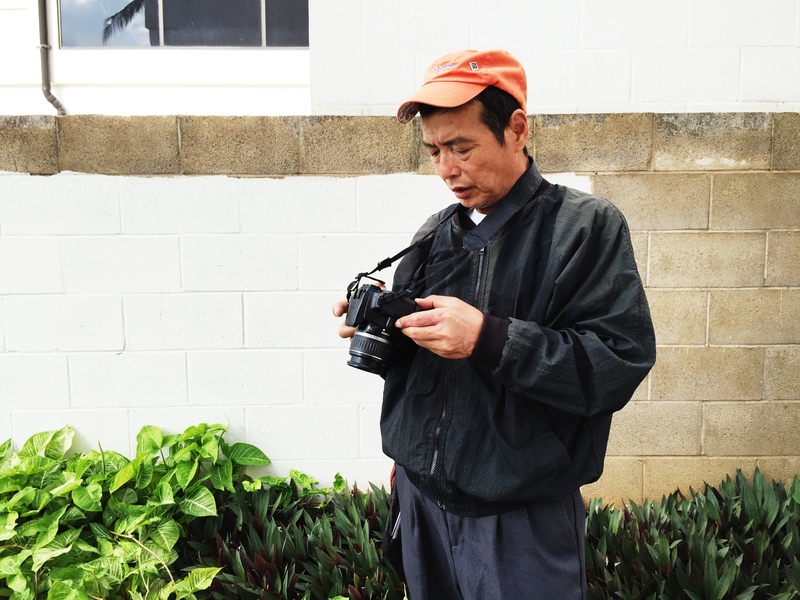 As we drove back, we entered an area of the Honolulu where I had approached him just less than 6 months ago. I wrote about that experience in an older entry, “The Ring Pop Bearer.” Even though my dad was sitting right next to me, I could still see his silhouette on the corner of the street. It’s hard to brush that one off. I want him to stay in this good place, to continue getting healthy, and to be able to share his talents and purpose with the world. It still scares me that something could go wrong, and I know the reality is that he could easily stop his treatment plan and find himself right back on the streets again. It is a reality that happens all the time, but I’m hoping that sparking his interest in photography will give him something to look forward to… And who knows, maybe he could earn a little something too. For now, we’ve made plans to meet-up on certain days so I can help him store his files and show him how to edit them. He shared the importance of communicating our “personalities” through our photography, and that this is the only way the commonplace things in life can stand out. Be yourself. Show yourself. And most importantly, share yourself. 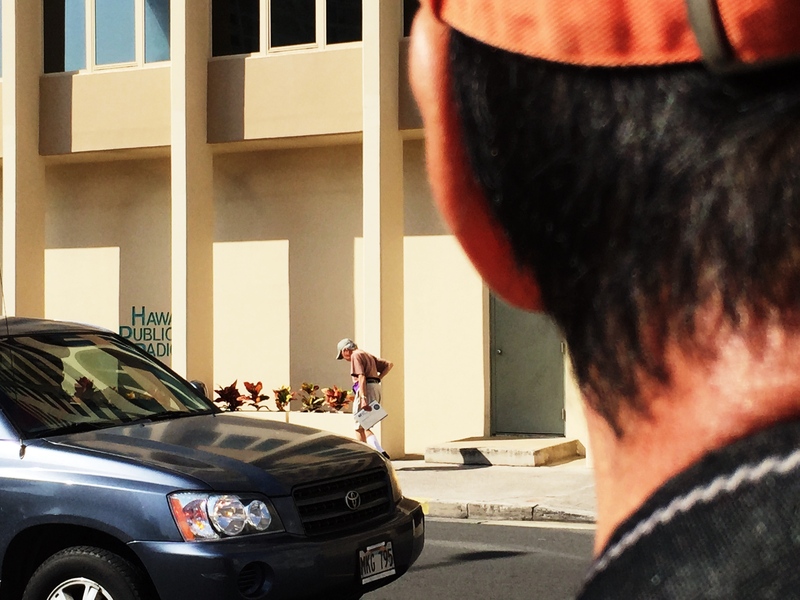 Ironically, we parted ways in front of the Hawaii Public Radio building. My final capture of him (below) was just another reminder of how fragile and fleeting our lives can be. Life is good. Keep moving forward. There are many others still out there. It’s all or nothing, so if I don’t hit the goal… I don’t get any of the pledges. 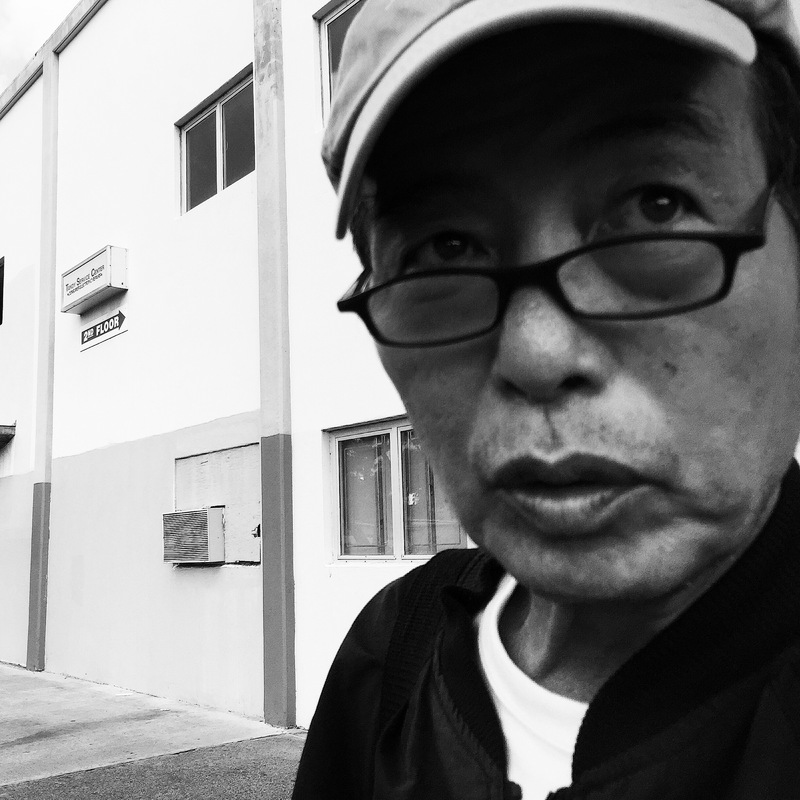 My father looks towards the Hawai`i Public Radio building, where I shared our story. Yet another heartwarming piece… Looking forward to maybe seeing some of his work, if he wants to share.